With help from friend and fellow producer and DJ Marky, the epic Bassbin smasher “Stars in the Dark” hit in 2005 and flew up the charts, helping to put Random Movement firmly on the map. Since then the releases and collaborations have been pouring forth, with projects including Mixmaster Doc, S.P.Y and Redeyes to name a few. His tracks have turned many heads to his unique skills in both his songwriting and production, and his soulful, smooth and sleazy vibes have landed him releases on such labels as Innerground, Liquid V, CIA and Integral. 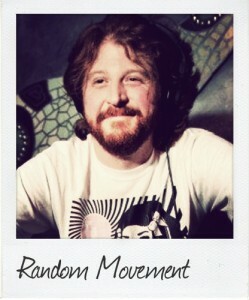 With an album out on Innerground, weekly radio shows and a monthly podcast (www.randommovement.org), as well as tours being planned all over the world, things are continuing to be very productive for this year and many more to come.